On August 11, 2017, the devastating Charlottesville riots took place leaving catastrophic results. Originally called the “Unite the Right” rally, it was supposed to be a rally supporting White Supremacy, Neo-Nazism, Anti-Semitism, and other similar views. During this rally, counter-protesters arrived at the original rally. This led to violence among the two groups, many resulting injuries and even a fatality due to a car being driven into a large body of counter-protesters. The rally was originally focused on protesting the removal of the Robert E. Lee statue in Charlottesville’s Emancipation Park, and in the midst of the following events, a national debate came to light on whether Confederate monuments should be kept up or removed. Two days after the riot’s conclusion on August 12, “The Boys Who Wore The Grey” monument in Durham was removed by a group of protesters from the pedestal where it had resided for about 93 years. Under almost the exact same circumstances as the statue in Durham, Silent Sam came down as the result of an anti-Confederate, anti-racism protest at UNC. However, according to the North Carolina legislature and UNC president Margaret Spellings, Silent Sam must be returned to its original location 90 days from its toppling, November 18. Most people who believe the statues should remain in their current locations claim that they are part of the country’s history. To them, these statues aren’t a symbol of the Confederate viewpoints and racism, but part of the path the United States has taken to become the great nation it currently is today. Contrary to that belief, many people perceive the statues to be clear signs of racism and a defense of slavery. According to the News and Observer, even UNC’s website says that “many view it as a glorification of the Confederacy and thus a tacit defense of slavery.” When Julian Carr erected the statue in 1913, he promulgated a long tirade supporting prejudice and racism. This monument is a transparent mask of the hate contrived within Confederate America. In light of both sides, Governor Roy Cooper proposed a solution in which all Confederate monuments are moved to a historical site. There they will be both out of the way for anyone who finds them offensive and they can be in a place where their history is preserved. Cooper found a clear-cut compromise for both sides, where each receives what they desire. Even with this solution, the North Carolina Legislature, being predominantly Republican, abrogated the proposal. Although it is important to maintain a sense of our nation’s roots, people will continue to feel the effects of hate and racism from the presence of these statues, all while the negligent North Carolinian legislature proceeds to strike down fair solutions and prolong tensions. What Berger and people who oppose Cooper’s proposal do not understand is that the protesters who removed Silent Sam on August 20 will not be easily stopped. If they knew that they could have been arrested when they knocked down the statue in August, they will not abide by the state law in the future. By reinstating Silent Sam, the legislature is only causing more unrest between protesters and law enforcement. Violence should never be condoned, but with the rejection of Cooper’s proposal, it seems almost inevitable. Though Confederate history should be maintained and studied, Confederate monuments should not remain in public spaces. Any sign of hate should not be publicly displayed, no less upheld by any form of government. No one should have to worry about being discriminated against in modern society, yet it is something we as a nation struggle with. Let’s unite to silence Sam, and to get rid of the racist aspects behind his presence. Three minutes. That’s all the time that Carrboro High School students have between each class. Three minutes may seem like a lot, but when you factor in using the restroom, grabbing a quick snack, dropping something off at the office and, of course, the slow walkers, the time you need increases. Unfortunately, we cannot change the amount of time between classes. However, we can change how we walk in the hallways. School is stressful enough; walking through the halls between classes should not contribute to that stress. The hallway between class periods is not the time or place to congregate with your friends. Although class time may not be important to everyone, please respect the time of the people who feel that it is. When you force people to walk around you, it holds up the tens of people behind you, causing a traffic jam! Social time is not in between classes; rather, socializing should be reserved for lunch and after or before school. Better yet, why don’t you walk and talk at the same time? Another thing to consider is your pace while walking through the halls. We all have someplace to be, and wouldn’t you like to get to class on time, maybe even with a minute to spare? Take the people behind you into consideration and pick up the pace. Next time you are walking in the hallways, please consider the time of other students around you. Most people do not like taking tests. They’re stressful, a pain to thoroughly study for and can contain deadly pitfalls, like trick questions or “none of the above” answer choices; but the worst kind of test is actually the one most people seem to prefer. Multiple choice tests have the potential to hands down be the worst kind of test someone can be given, yet most students seem to prefer them over free-write tests. 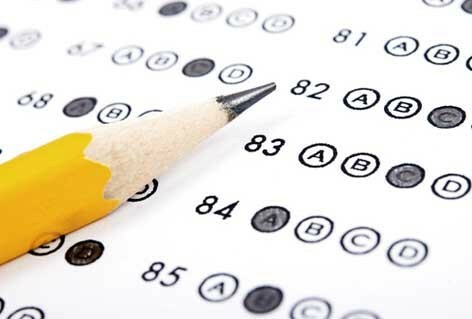 Multiple choice tests are typically seen as being ‘easier,’ since you can just pick the answer choice that looks the better than the others and do well; however, if you’re taking a MC (multiple choice) test that has real effort put into it, the agonizing experience outdoes the pain of most free-response tests. Multiple choice tests contain tricky psychological mind games, which spawn from a combination of the MC test structure, the teacher’s choices and the student’s thought process. This ideology is especially destructive when paired with how teachers make MC tests. I made one myself for a homework assignment once, and discovered that I had a tendency to gravitate back to a certain letter to be the right answer, and found it hard to deviate — many teachers have this issue as well. A result of this phenomenon is the occasional string of same-letter answer choices, which results in students doubting and second-guessing their answers. In many MC tests I’ve taken, there is usually one default ‘right’ answer choice; a letter that pops up frequently during the test as the right answer. This can be useful or harmful, depending on how this letter appears during the test. For this example, let’s say that the teacher has a tendency to choose B as the right answer choice. If a string of Bs are presented as the right answer choice for several questions in a row, then a student might choose another answer out of fear that they’re wrong; but if the Bs occur more frequently than the other letter choices — but not necessarily in a row — the student can use this to their advantage. If a student is on the fence about an answer choice, and ‘B’ is a viable option, selecting it would give him/her a better chance of getting the answer right. Finding that equivalent of ‘B’ in other MC tests can lead to a failsafe answer choice: the one you select if it’s an option, but you’re not entirely sure is correct. Another issue with MC tests is how some of them are created solely to be a major headache. Some teachers create questions with answers that are all slightly correct, but one is the right choice due to some small detail that makes it “the most correct.” Depending on the subject, the line between objective correctness and subjective correctness can be blurred, leading to post-test conflict between teacher and student. In a free response test, you can sometimes get partial points for a partially correct answer, but in a MC test, an answer choice that’s not perfect lands you with zero credit. There are advantages and disadvantages to multiple choice tests, most of them psychological; in the end, taking the test itself becomes a large part of the actual testing process, rather than a pure gauge of knowledge. This applies to all tests, but is especially obvious and annoying in multiple choice tests. Gun control and the Yemen conflict; women’s abuses in America and women’s abuses in Iraq; food insecurity in the U.S. and famine in Venezuela. The contrast of these issues — of those that worry the everyday American and those that destroy the lives of people every day in countries across the world — can be a daunting one. However, comparing your life and your issues to those of other people in another country is a task fraught with risk. We all heard the saying as kids when we wouldn’t finish our veggies: “There are starving kids in Africa who don’t get anything to eat — you should be grateful to even have this meal.” And while that might motivate you to choke down another asparagus stalk, that comparison is wholly unfair. Comparing issues across national borders not only partakes in an irresponsible ignorance of the massive cultural and developmental differences between countries, but can also actually serve to worsen the disparity between peoples of different nationalities. In his book The Broken Ladder, UNC professor Keith Payne spends hundreds of pages examining the overwhelming evidence that comparisons to people outside of one’s social and economic strata has adverse impacts on a person’s psyche and decision-making process. When we, as children, compare ourselves to those starving kids in Africa, it has two main outcomes. The first is that we come to understand that we have something, and those African children do not have that thing — in this case it’s food. Second, and more insidiously, we come to think of those African children as separate from us — as “the other.” And there lies the true danger of cross border comparisons. Too often, these comparisons are framed through the lens of difference — it’s easy to think, for example, that a Syrian refugee lives in a totally different world from us and is of an entirely different stock than us. They are, therefore, not one of us. This in turn makes it more and more difficult for us to empathize with their plight and fulfill our moral duty to help them. While the differences among people of the world are undeniable, it’s also undeniable that we share one key feature: we are all humans. That’s what is important to remember when juggling with the issues that plague humans around the globe. Comparisons aren’t all bad, so long as they’re done in a manner that balances them with a consideration of the things that make us the same. For each time that you fret over the political insecurity that’s displaced millions in the Middle East, remind yourself that those displaced humans have many of the same wants and needs that you do. They seek a roof over their head and a meal on their dinner table every night. And while most of us here at Carrboro are lucky enough to have those things, that doesn’t make us any better or any different than the people that don’t, especially as those who go without can be found in a tent camp in Turkey and in the seat next to us in chemistry. #Enough is enough. 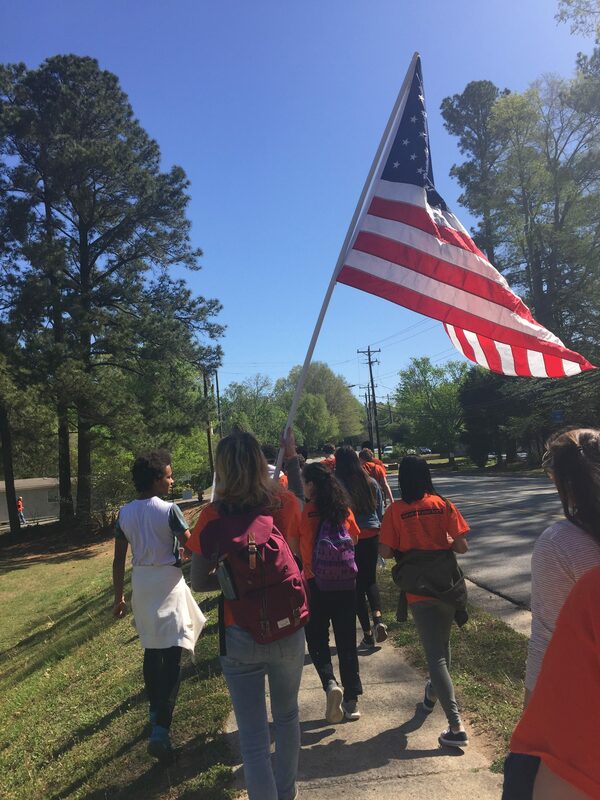 On April 20, students in Chapel Hill-Carrboro City Schools left class and marched to the Peace and Justice Plaza, on East Franklin Street, in protest of gun violence; however, debate over the walkout could be heard much earlier. Carrboro High School was filled with voices advertising the walk out. Students said, “if you are physically able, you should be walking on Friday.” Or even, “would you rather be shot or risk detention?” as there were threats of detentions and notes in your file for walking out and skipping class. The peer pressure that students felt is unnecessary. Each and every student should be able to show and express their beliefs and views in the way that they choose to do so. Choosing whether or not to walk out has been a challenging decision for some, and many have witnessed extreme amounts of peer pressure. They’ve been told that if they don’t walk out then they don’t care, or it isn’t important to them. Well, not necessarily. Some students don’t hold this cause near and dear to them. Some students don’t think that it is important. Everyone has their opinions that they are entitled to. They should not be asked to explain themselves, but if they would like to, they deserve the same respect and open ears that everyone else receives. However, there are also students who really would have wanted to participate, but couldn’t for various reasons such as sports, absences, tests or even because their parents didn’t want them to. And some students don’t want to risk getting a detention or a note in their file. Carrboro High School was a sea of orange. Many students showed their support by wearing the orange shirts whether or not they walked out. No one should be shamed or judged for their decision, but sadly this isn’t the case. Most students expect every other student to have the same opinion that they do and don’t understand when they don’t. Some students think that the cause is important but don’t agree with the proposed solutions that are be- ing represented through the walkout. I’ve seen a lot of exclusivity in the various walkouts that I thought were supposed to bring people together through a common goal. There are only a few views and opinions being represented. If you have a different idea, you’re likely undergo scrutiny for your views. Seems a bit hypocritical if you ask me. Speaking of hypocrisy… why is it that it takes students from an upper-middle class, majority white school to be shot and killed for everyone to be up in arms? There are kids, teens and adults alike killed in neighborhoods every day. Ah, the college visit. The hectic, iconic and overwhelming day and a half through which students are expected to make a decision about the next four years of their lives. While college visiting is always in season (when in Rome, or, uh, Boston, right? ), summer vacation is a popular time to load up the car and hit the road in hopes of finding your dream school. As a self-proclaimed college application enthusiast, here are my tips to make the most out of your trips year round. While June through August is a nice time to travel without missing school, remember that college students are also on vacation; it’s difficult to get the vibe of a desolate campus. Don’t cancel your plans just yet, but keep this missing piece in mind when comparing different schools. Schedule permitting, you may be able to visit certain colleges during one of their first weeks of class and before you’ve gone back to school yet. Also take note of weather traps: August in Vermont is beautiful, but you’ll likely spend that month next year at home, not at college. This goes the opposite way (a word of encouragement, not warning!) for extremely warm weathered schools. If school is in session, make like Inspector Gadget and spy. 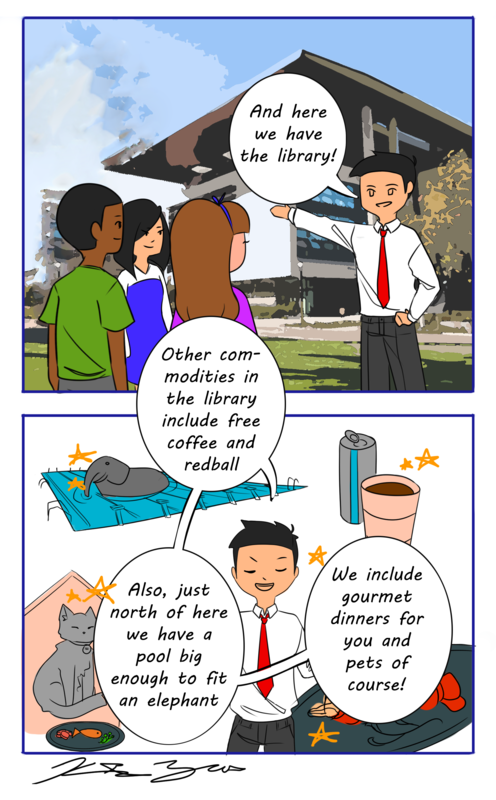 Do students use the school’s common spaces? Are they constantly on the go? Do they sit in groups or by themselves? Do they seem happy? These things are sometimes difficult to assess from afar, but they can help differentiate schools with otherwise similar offerings on paper. Another way to get a picture of a college beyond a basic information session and campus tour is to pretend like you’re a student. Bring a book, find a crowded place like a library or coffee shop and just hang out. Say hi and even make a friend or two, if you’re feeling bold. Again, it’s a small gesture, but it can help you get the feel of a place and figure out what students are like when they’re not trying to recruit you. Sneaky. If possible, do an overnight visit. It’s not a perfect way to picture life as a student, but it’s probably as close as you’ll get. Oftentimes, colleges will set you up with an overnight host if you just email the admissions office (did someone say demonstrated interest?) Otherwise, ask around for a friend of a friend. Let’s face it: it’s the college’s job to sell themself, so they’re going to be biased. To help make the best decision for you, go in knowing a few things that are important to you and a few that aren’t. Brown University may be proud of their open curriculum, but if you like the structure that General Education Requirements provide, that’s great too! UNC Chapel Hill may love their sports teams, but if athletics aren’t your priority, that’s okay! Just bcause a college is excited about something doesn’t mean you have to be excited about it too. Remember, every admissions officer will tell you that they love their college. Don’t judge how they present their information, but rather the things they choose to emphasize. That being said, don’t be afraid to change your mind about things you think wanted or didn’t. Finally, the information session isn’t everything; some good old fashioned internet research at home will augment your information and prove just as helpful. Protest can take many forms, and, although marches and public displays may come to mind first, civil disobedience is one form that can be often overlooked. Civil disobedience is a type of protest: the act of refusing to comply with laws in a form of protesting. There are many people that have displayed the courageous act of civil disobedience, but there are even more who haven’t and, in a district like CHCCS, I think it’s unfortunate how many are in the latter group. On March 10, students all over the nation walked out of their schools at 10 a.m. to commemorate the 17 lives lost in Parkland, Florida and to call attention to the need for more safety within schools. In some schools, students were disciplined for the act of walking out, but in CHCCS, not one student received any sort of discipline. One could ask, then, if perhaps that lack of punishment was one reason that turnout was so high. There was no civil disobedience involved in the March 10 walkout. People strolled out of class, listened to some speeches, and then went back to class. However, I believe that the next student-led walkout was not same. April 20 was 19th anniversary of the Columbine school shooting in Jefferson County, Colorado that saw 12 students killed. On this day, Parkland students involved in the Enough movement planned for students across the nation to walkout again at 10 a.m., but, this time, to not go back. 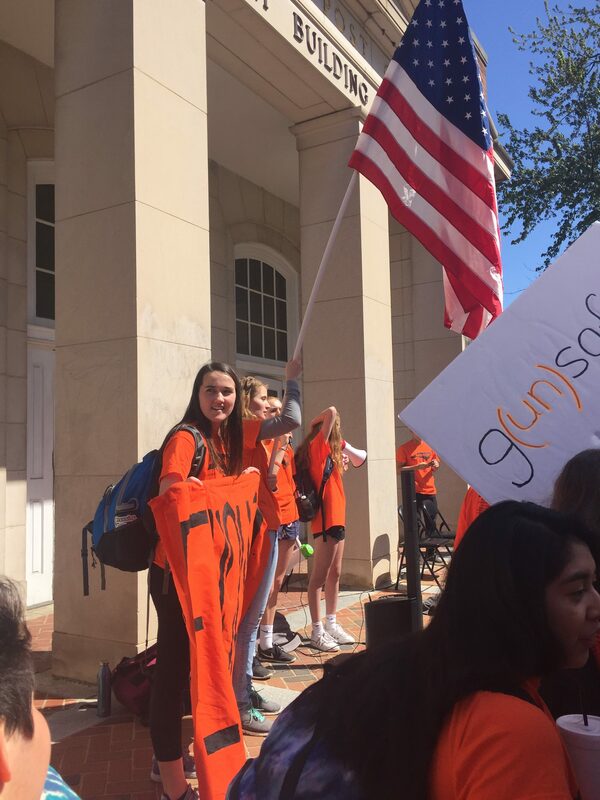 Students were instead encouraged to go to local officials and push their demands regarding gun laws and safety in school. Well, walking out of school for the entire school day is considered skipping. So I wondered how many students would express interest in this walkout. With athletic games, college transcripts and all around fear of getting in trouble, I doubted that support would be very high. Privileged students are afraid to harm their futures and afraid of actual civil disobedience. I believe that many students are accustomed to having things handed to them. In a competitive district with opportunities to engage and be involved in any- thing that you want, most students have not had to fight for anything more than their GPAs. After the walkout, my theory was shattered just a little. As predicted, students still managed to try and get around the punishments. People got notes for “educational opportunities” or came back after they rally ended. However, there were some students that believed in and knew about civil disobedience. It’s the acts of these individuals that catch the attention of lawmakers and public officials to decide we need to do something. So, almost a month later, the conversations have ceased, and the student activist have gone back behind the scenes, but what’s next? Is this enough for one year, for one high school career, or will the conversation continue? Recently, while perusing the JagWire, I found myself reading a disturbing article. The article titled “In appreciation of canine companions,” erroneously claimed that dogs are the best pets known to man. As a proud cat owner and enthusiast, I’m here to disagree. According to the Smithsonian, cats have lived with humans for around 12,000 years. When humans first started farming, storing food and creating civilizations, wild cats became useful as pest control. Thus, the symbiotic relationship between felines and humans first appeared: cats ate the pests and the humans were left with undamaged crops. As time went on, many civilizations began to see how beneficial and extraordinary these domestic felines were. 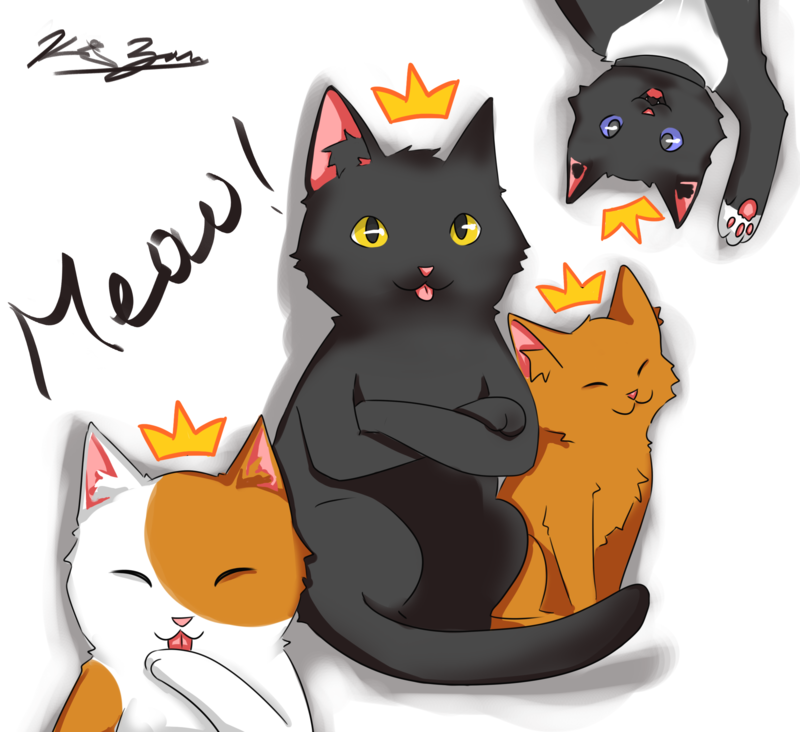 Ancient Egyptian, Roman, Greek, Indian, Persians and Chinese cultures all had a special history with cats. Most of these populations revered cats, viewing them as sacred, even divine, animals. The Egyptians loved their cats so much that they would shave off their own eyebrows in mourning if one of their pets died. Historical evidence aside, cats have long been important in human households, not just because they are useful, but because they are cuddly, friendly and fiercely independent. As any cat owner will tell you, cats can be aloof, condescending and autonomous; it’s true. But once you gain a cat’s trust, they are loyal to you for life. They’ll settle down on your lap, rid your house of mice or provide a source of silent support when needed. Many people will claim to hate cats just because they are more partial to dogs. I’m not saying that dogs are evil, or any worse than cats. I simply believe that cats are superior pets. No cat will drool on you or clamor for your attention. No cat will wake you up in the wee hours of the morning because they need a walk. No cat will bark whenever a stranger comes to the door. While some will meow or beg for food, a well-fed and pampered cat can be a delightful companion. Cats are wonderful, individualistic, anthropomorphic, low-maintenance pets – what more could a human ask for? Unsurprisingly, America agrees. According to the Smithsonian, cats are the most popular house pet in the U.S., with over 90 million felines in American homes. In our culture as well, cats have become beloved icons, with representative figures such as Puss-in-boots, Garfield, Grumpy Cat, Hobbes from Calvin and Hobbes and Tom from Tom and Jerry. Cats can also be inspiring, as well as comforting, pets. According to Buzzfeed, Nikola Tesla, the original inventor of the light bulb, started to study electricity after his cat gave him a static shock. Cats have superhuman powers, too: they can run three miles per hour faster than Usain Bolt, and they can make over 100 vocal sounds, which is pretty cool. Personally, I love my cat. Just the other day, while I was sitting on my couch and avoiding my homework, he climbed up into my lap and went to sleep. His comforting warmth gave me a feeling akin to a cup of hot chocolate on a cold winter day. In my opinion, nothing compares to the face of an adorable kitten, especially when they crawl up to you, looking to be scratched. I wouldn’t trade my furry feline friends for any amount of dogs in the entire world – and that’s that. The GMO-free cosmic forces of the universe suggest that soon you may find yourself tempted to be “healthy” or “productive.” Though these concepts sound appealing to your more rational side, you will find that sitting inside all day binging Netflix is the best way to align your inner energies. The energies of romance are on your side today; your love interest will make awkward eye contact with you for a few life-altering moments. You should definitely propose on the spot, as the stars are clearly aligned in your favor. If you are rejected, it is likely due to your love interest’s chakras being conflicted, and you should not take it too personally. Though your friends beg you to stop making bad jokes and puns, you should most definitely continue to do so. The forces of nature are on your side, and every distasteful pun you make will secretly bring joy and laughter into your friends’ hearts. When they stop talking to you, it’s because they are in denial of your comedic genius. Don’t worry — they will come around eventually. Your humor rejuvenates and uplifts the inner souls of those around you, so don’t hold back. You may think that it’s a good idea study for that upcoming test, but the elusive energies of luck are definitely on your side, so you should spend your time procrastinating instead. With the forces of fortune on your side, you will most certainly pull a high A; there’s no need to look over that silly twelve page review sheet. decided for you. Saving up money to be “financially secure” is a concept that only appeals to weak-willed people who are not truly living life to its fullest. and they will surely thank you for it afterward. You may be kicked out of the room for “being a disturbance,” but no great revolution ever goes without its complications. The cosmic forces are on your side today, and you should take some great risks. Approach a stranger! Buy some thing on an impulse! Walk to NYC! Drop out of school! Your shy disposition holds you back, but go forward with confidence as nothing can go wrong today. Do not listen to those who doubt you as they are simply trying to hold you back. One of your friends will soon come to you with an issue of utmost importance and will ask for your advice; you are someone who is more than qualified to help them out, so assure them that they have come to the right person. Take your friend to an empty room, then ask them to meditate with you; their problem can be solved by dissolving negative energies, so with a bit of meditation, any issue they have will be resolved within minutes. If your friend refuses to meditate, force them to. They are just in denial and will benefit from your spiritual genius. You will likely have an upcoming paper to write in your English class. Instead of actually writing it yourself, you should have your little brother/sister/pet do it instead as their natural energies are currently more aligned with the stars than yours are, and they will have greater success than you ever could. It’s not cheating, since you are merely unlucky due to your soul’s misalignment. Though getting a full night’s sleep is said to be healthy, the cosmic energies suggest otherwise. Staying up late and procrastinating for several hours is the most effective way you can find your purpose in life as the earthly forces have deemed it so. Your inner spirit will be most in tune with the universe if you get as little sleep as humanly possible. Due to negative energies plaguing your household, it would be a good idea for you to burn large amounts of incense in your room to lessen their strength. The spiritual power incense holds is well-known. The smokier your room is, the stronger your barrier against negative energy. If you are worried about the fire alarm going off, feel free to disable it. Recently you may have had issues connecting with other people and properly displaying your emotions. This issue is easily solved through interpretive dance. As dance is a highly emotional art form, you can easily convey what you are feeling to those around you. The next time your teacher gives you a pop quiz or a bad grade, connect to them through spiritually-charged choreography. No one can resist the power of dance.